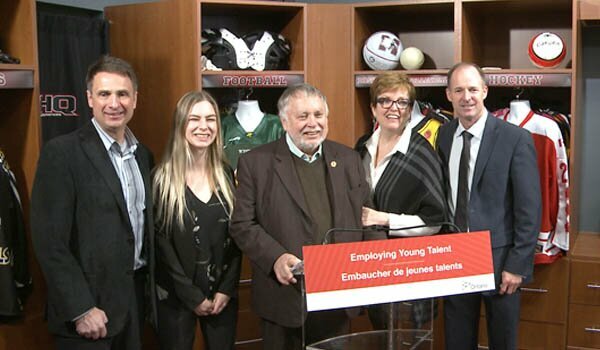 Treasury Board President and the Minister for Digital Media, Eleanor McMahon, announced the “Employing Young Talent Incentive” by the Ontario Government at an event in Hamilton. This new incentive will help small business hire more youth and with the help of YES and other organizations, help change lives. YES President & CEO Timothy Lang was the MC for the event, while it was hosted by Niko Apparel’s President, Joe Camillo. Camillo has helped many young people over the years and his business, Niko Apparel, is a great local success story, marketing sporting clothes worldwide, including outfitting parts of the Olympic Team for Canada and many other nations. Minister McMahon was joined by Camillio and Lang and MPP Ted McMeekin, has had a career of public service and helping bring people out of poverty. 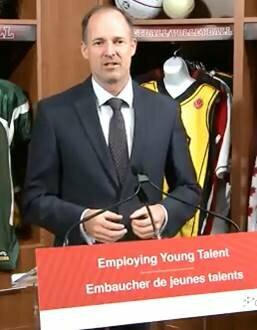 The new incentive will help YES with business to hire more youth. This entry was posted in News, YES in the Media. Bookmark the permalink.